Just when you thought it couldn’t get any better – FAST is thrilled to announce the 1st Global Summit on Angelman Syndrome. The summit will include an Education Strategy Seminar on Saturday afternoon and a Scientific Round Table with Q&A on Sunday. These two events will be free to our AS parents and guests. Please visit CureAngelman.org for all the exciting details. 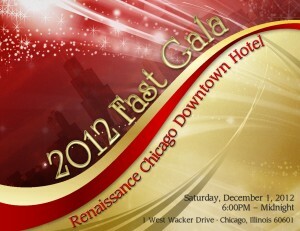 No one will want to miss the 5th Annual FAST Gala. There is so much to celebrate this year! If you haven’t already done so, save the date, call the sitter and, if necessary, ask for time off of work! FAST’s 5th Annual Gala will be held on Saturday, December 1, 2012 at the Renaissance Chicago Downtown Hotel . 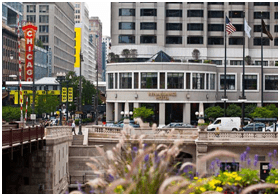 This Chicago luxury hotel is steps away from shopping, dining and famed Millennium Park. At this riverfront hotel, you’ll experience stunning skyline views of the city’s architecture. This hotel also has an indoor pool! The chef and staff at the Renaissance are already working overtime to make sure our guests have a fantastic experience! They already love our kids and understand how important this night (and weekend) is to all of us. We’re so excited to announce that returning for a 4th year in a row is FAST supporter, AS parent and Golden Globe Award Winning Actor Colin Farrell. Also returning for a 4th year is local music sensation and the hardest working band in Chicago, 7th Heaven. Get ready to rock! So whether this is your 1st Gala or your 5th, whether you’re hoping to connect with old friends or make new ones, we welcome you and know you’ll have a fantastic time. This venue can hold about 100 more guests than last year’s. Please note that we do expect to sell out again this year, so once tickets are available, please make sure to secure them for yourselves and any guests as soon as you can to make sure you don’t miss out. FAST, as always, will attempt to outdo ourselves with parent ticket sponsorships this year. At this time, we are announcing a limited release of 200 tickets. The parent ticket lottery will be held later this summer after which any remaining tickets will be released for sale to the general public. You may purchase your tickets now by visiting CureAngelman.org and clicking on the Gala Graphic. It’s with sadness that we leave the Hyatt Regency Chicago, our home for the past three events. We’d like to thank Rebecca Stern of the Hyatt for taking such good care of us. We’ll miss you!